(Phys.org) -- Fullerenes were first discovered back in 1985 by a team of physicists vaporizing graphite in helium gas, one class of which, the buckminsterfullerene (C60) named after Buckminster Fuller and his geodesic domes, forms into spherical, hollow cages that resemble soccer balls. Since that time, a lot of study has been done on and with so named buckyballs, yet no one has been able to figure out how exactly they form. Now, new research by one of the original discoverers of fullerenes, Harold Kroto and his team at Florida State University moves closer to that goal in finding that buckyballs grow larger when exposed to vaporized carbon. The team has written a paper describing their observations and have had it published in the journal Nature Communications. Because of their similarity to graphene, sheets of one atom thick carbon atoms that form hexagonal patterns, researchers have wondered if fullerenes might come into being after first existing as simple sheets that somehow warp to the degree that they form into balls. Unfortunately, no one has yet been able to create the right set of circumstances that have allowed them to witness the actual birth of a fullerene structure, though they have found that they also exist in nature as well, specifically in the soot that comes from burning candles, and near red giant stars or supernovae. 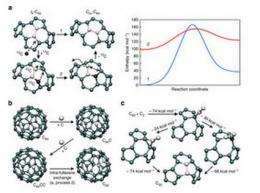 Using a Fourier transform ion cyclotron resonance mass spectrometer, Kroto and his team were able to analyze what happens when buckyballs come to exist in the same space as vaporized carbon, they grow larger. They found that small fullerenes grew to buckyball size, and buckyball sized fullerenes grew into larger balls by eating or absorbing carbon atoms into their structure. They also found that the original structure was maintained by atoms being shifted around during the absorption process. In learning more about how fullerenes are formed, and now how they grow, researchers are able to apply new evidence to help explain other natural phenomenon, such as how they come to exist in space in such large quantities such as is found with carbon stars and supernovae and why their distribution in the lab is so similar to what is found in the soot produced by a burning candle. Has graphene been detected in space?